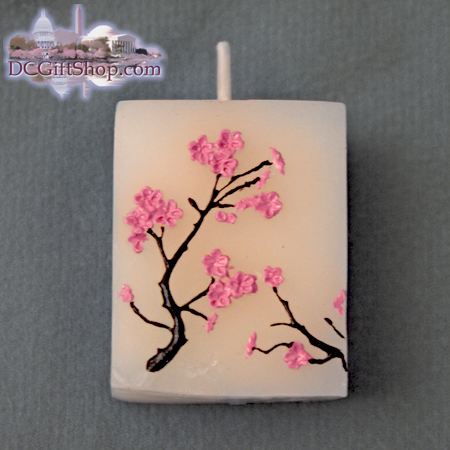 This National Cherry Blossom Festival candle is a sweet and lovely sign of spring masterfully painted on a simple, square, white candle and will bring elegance and promise to any occassion. The Cherry Blossom Candle, beautifully adorned with the Asian symbol of love, affection and good fortune, invites you to dream of faraway places while basking in the warmth of where they are. Featuring finely painted pink cherry blossoms on brown branches decorating the front of the parrafin wax candle, candle measures 2" h x 1 1/2" w x 1" l. Clear gift box is accented with chocolate-brown, grosgrain ribbon and bow, with a matching, round "For You" tag (can be removed).